When my husband and I first decided to adopt we were over the moon. Finally, we would begin to build our family! Then came the reality of the costs of adoption. With domestic adoption costs averaging between $8,000 – $40,000+ and international ranging from $20,000-$30,000+, adopting a child was going to be a financial struggle. Thankfully there is something called the Adoption Tax Credit. The Federal Adoption Tax Credit (ATC) has been around since 1997 but fluctuated from year to year. In January 2013, the ATC was made permanent by Congress. Though it doesn’t help with the upfront fees, the Adoption Tax Credit was designed to help offset the qualified adoption expenses for the adoption of an eligible child. Per the Internal Revenue Service, an eligible child is “an individual who is under the age of 18, or is physically or mentally incapable of self-care.” Eligible children are those children adopted through international adoption, domestic agency and private adoptions, and public foster care adoptions. An important distinction about the ATC is that it is not a tax deduction it is a tax credit. Where a deduction (like charitable giving or a home office) reduces your taxable income for the purposes of determining your liability (how much you owe), a tax credit is applied after your modified adjusted gross income (MAGI) is calculated. That said, because it is a tax credit it is non-refundable. That means if you have no tax liability (you don’t owe anything) you can’t benefit from the credit. For those adopting domestically you can essentially “claim as you go.” You must wait one year after you incur the expense to apply it towards your tax credit, but you do not need to wait until your adoption is completed. In fact, should your adoption be unsuccessful you can still claim the credit, no restrictions. For international, you must complete the adoption in full in order to receive any credit. For example, we began my son’s adoption in 2014 but our adoption was completed in January 2015. We received no tax credit in 2014, even though we had paid nearly all our adoption expenses, but we were able to receive the tax credit in 2015. If your adoption is unsuccessful, unfortunately in international adoption no tax credit can be claimed. The maximum tax credit available increases from year to year. For 2016, the maximum credit was $13,190. For 2017, the maximum credit is $13,750. It’s important to note that this amount is per child so if you are adopting two children, the credit doubles. But you only receive a credit for as much as your adoption costs. If your adoption only costs $10,000 to complete, then you would only be eligible for a $10,000 tax credit and not the full $13,750 available. The same is true if you are fortunate enough to work for an employer who offers an approved adoption assistance program. In this instance, if your adoption costs $20,000 and your employer gave you $10,000, then you would only be eligible for a $10,000 tax credit. Another good thing about the Adoption Tax Credit is that you can apply the credit for up to five years if your tax liability is less than the full tax credit amount. For example, say with your MAGI you only have a tax liability of $4,000. The first year you would receive the $4,000 in a tax credit and the remaining $9,750 would roll over into the following year. Unfortunately, the Adoption Tax Credit does have a cap. For families with an MAGI equal or less than $203,540 the tax credit gradually decreases with your earnings. For families earning $203,540 or more, no tax credit is available. 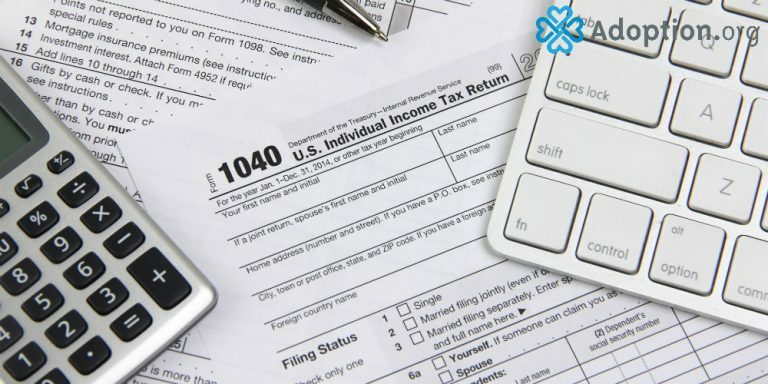 Though it may seem complicated, most tax professionals can help you navigate. Even if you choose to eFile through programs like TurboTax you will be able to claim your Adoption Tax Credit. Just look for Form 8839 and attach it to your 1040. Only hitch? Married couples must file jointly to receive the tax credit. Want to make things easier come tax time? Make sure to retain your adoption receipts or even make a spreadsheet of your expenses as you go. For more on qualifying adoption expenses visit the IRS website.